Urban fraud myths are everywhere, which if believed often leave people in danger of becoming a victim of fraud and cyber crime. For the next 13 working days, Action Fraud and the City of London Police will be identifying common fraud myths and letting people know the reality of these myths and possible ways to avoid falling into the fraudsters trap. 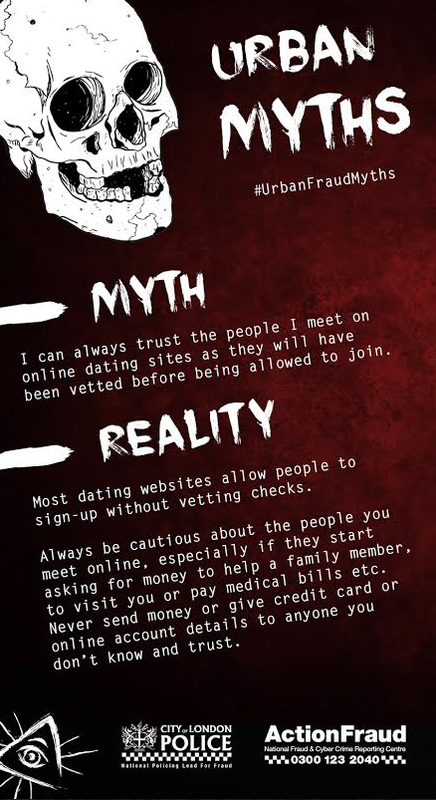 Day one of the campaign kicks off with a well known dating fraud myth; many people believe that those joining dating websites are vetted before they are allowed to have a membership; however this is very rarely the case. The reality is that most dating websites allow people to sign-up to the website without vetting checks, which means that fraudsters are able to use the website to target people online and defraud them. We shall be posting each message on this site and encourage everyone to share the information so that we can help protect each other.